For the first time in a long while, I actually got Goosebumps. Not that mediocre Jack Black flick from a couple of years back, rather that feeling when something just goes through your body and one feels at tune for just being. Like my feeling with horror flicks and my love for anything related to John Carpenter, this one gets a pass in my book, since I’m a devotee of Queen and their amazing music. For starters, lead Rami Malek emulates the real Freddie Mercury through and through. If you think you’ve seen Malek before, you’re probably right. He was on the Golden Globe winning “Mr. Robot” for the past couple of seasons. Supporter Christian Slater receiving an Emmy win for his role as friend and confidant, the “Mr. Robot” of the title. I trust the director here in Bryan Singer, since he has not made too many bad movies. Early on in his career, he helmed one of the greatest pretzel-twisting mystery suspense with Christopher McQuarrie’s “The Usual Suspects,” which also saw the movie receiving a Best Supporting Oscar for co-star Kevin Spacey. That was early on in his career, 1995 to be exact. With “Bohemian Rhapsody,” Singer delves head on into their creation, with Malek’s persona even changing his name legally to Freddie Mercury to get more noticed by the press and mass media. One also has to realize this was in the pre cell phone days, where even being on the newly created MTV was considered a really big deal. In “Bohemian Rhapsody,” there is a brief scene that uses a track from “Highlander,” the one that includes the song “Who wants to Live Forever?” from the movie. 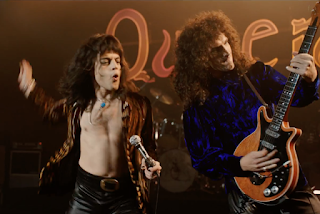 In “Bohemian Rhapsody,” Myers plays record producer Ray Foster, who scoffs at the idea of the even recording “Bohemian Rhapsody” as a stand alone track. He would later regret it, because even with a song that runs over six minutes in length plays through to this day. “Bohemian Rhapsody” delivers in every single department, even with a back story that does not take too much away.